Both products were subsequently transformed into contraband -- not by legislators but by law enforcement officials. The way that happened shows how easily policies aimed at promoting public safety can make all of us less secure by undermining the rule of law. Last week, Cracco, a Manhattan sous chef, won a federal lawsuit he filed after he was arrested for violating New York's 1958 ban on "gravity knives." That law makes it a misdemeanor to possess "any knife which has a blade which is released from the handle or sheath thereof by the force of gravity or the application of centrifugal force which, when released, is locked in place by means of a button, spring, lever or other device." For years, Cracco had been using his Spyderco Endura 4 folding knife, the sort of tool that is sold openly by retailers in New York City and throughout the state, for mundane tasks like opening boxes and bottles. On a Friday afternoon in October 2013, Cracco was standing on a subway platform, heading home to Connecticut, when a police officer spotted the knife clipped to his pants pocket and subjected it to the New York Police Department's notorious "wrist flick" test. According to Cracco and a co-worker who was with him, it took the cop four or five tries before he managed to swing the blade fully open with one hand -- a feat that Cracco himself had never attempted. Cracco thus joined the thousands of New Yorkers who are arrested each year for carrying the tools of their trades or hobbies. That bedrock principle of due process was even more flagrantly violated by the ban on "bump-stock-type devices" that took effect last week. The ban, which Donald Trump decided to unilaterally impose after such devices were used by the perpetrator of the 2017 mass shooting in Las Vegas, turned peaceful, law-abiding gun owners into felons for owning products that had been repeatedly deemed legal by the Bureau of Alcohol, Tobacco, Firearms and Explosives during the Obama administration. As Guedes and other bump stock owners point out in their challenge to the ban, that conclusion is plainly at odds with the legal definition of a machine gun, which requires that the weapon fire "automatically" and "more than one shot" by "a single function of the trigger." Bump firing is not automatic; it requires the shooter's active intervention, and it entails resetting the trigger after each round, as with any semi-automatic weapon. 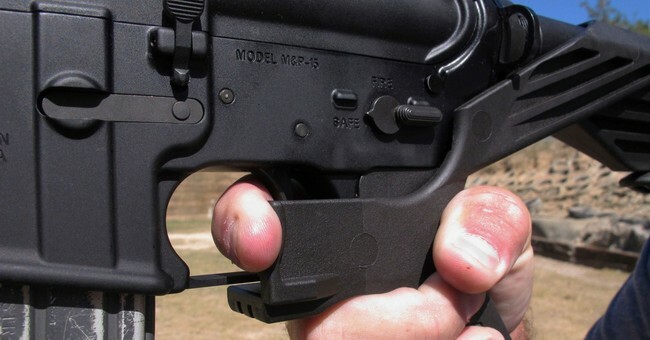 The question raised by Damien Guedes' lawsuit is not whether banning bump stocks is a good idea. The question is whether bump stocks are already banned.